Make calls to landlines and cell phones (some exceptions apply) to 10 countries worldwide! For a low monthly fee, talk to anyone, anytime for a maximum 2500 minutes each month! If your friends and family live elsewhere, combine your 10 countries plan with Pay-As-You-Talk and start talkin’! (Access the rate checker to see most updated rates to destinations not part of your plan). Make landline and mobile phone calls (some exceptions apply) to 50 countries worldwide with this convenient plan! For a low monthly fee, talk to anyone, anytime for a maximum of 2500 minutes each month! If your friends and family live elsewhere, combine your 50 countries plan with Pay-As-You-Talk and start chatting! (Access the rate checker to see most updated rates to destinations not part of your plan). † Plans are designed to be used by one phone number & for voice services only. Any misuse of service will result in termination of the plan. Prices shown are recurring monthly. The GLTalk FREE calling App allows you to make online phone calls, chat, video call and message with friends, family and business partners all across the globe. Using the power of the internet and premium voice-over-IP service, connect to anyone and everyone, no matter where they are! 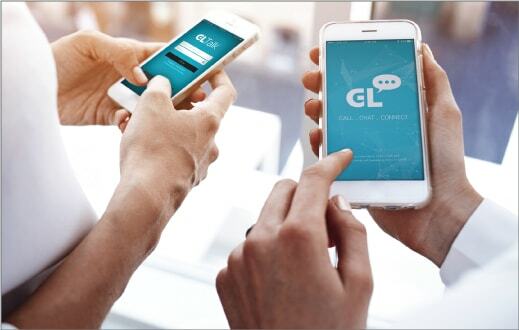 Have them join your group by downloading the GLTalk free calling app from the App Store or Google Play Store. With a multitude of handy convenient features, synch and connect with your contacts already on your smartphone. Fully integrated with your Android™ or iOS® contacts, the GLTalk online phone calling App is intuitive, user-friendly and reliable. It allows you to make free phone calls through the internet. Having the most competitive international calling rates on the market, coupled with the ability to make free WiFi calls through the internet,GLTalk is the perfect mobile solution for all your communication needs. While online, GLTalk users chat for free! They can place free phone calls to one another anytime, regardless of location. 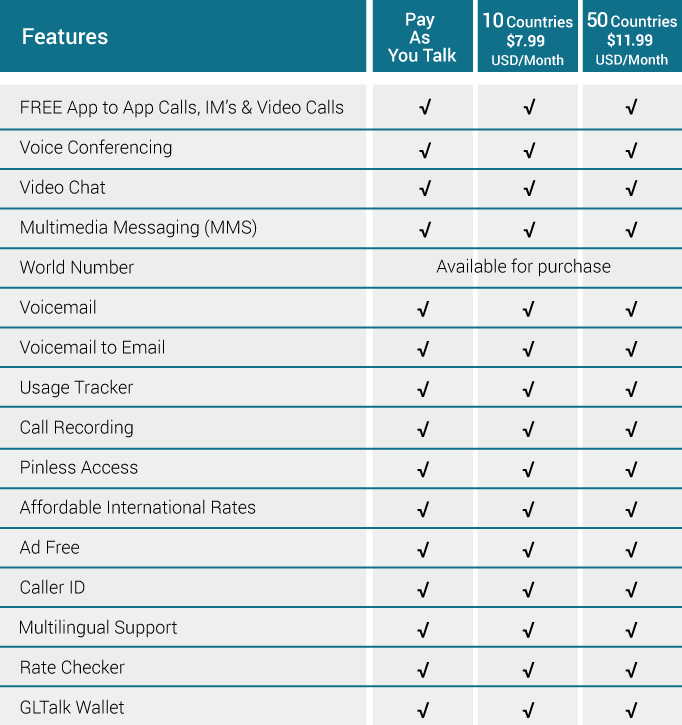 If they need to make calls to non GLTalk users, they can take advantage of our fanstastically low international rates. Compare our prices and see the difference. We have the best prices to the most locations. You can enjoy unlimited calling minutes with each other – this can even mean free international calls, no matter where in the world you are calling. Our 3 flexible and affordable calling plans, are designed to fit whatever your telecom needs may be. Choose from Pay-As-You-Talk, 10 countries or 50 countries package plans. The World Number option enables you to have your own private virtual line, that can be forwarded anywhere on the planet. Whether personal or business, the applications are boundless. 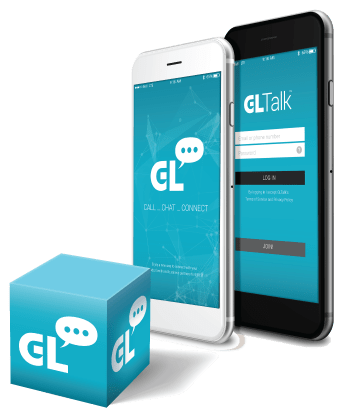 GLTalk users can even download the free application on their device and use it as their second phone number, virtually eliminating roaming fees while on WiFi networks abroad. GLTalk allows you to forward your voicemail right through the app, and archive a copy for future use, either on your device or on your email. You can also record every conversation on-demand. Both of these features are available for free on this premium calling app. Stay up-to-date with the rate checker feature, getting the latest international calling rates right on your phone. With over 25 years of expereince in offering long distance services, we guarantee the highest voice quality with competitive rates. Your funds will never expire and can easily be topped up right through the app. Your GLTalk calling balance is conveniently displayed at all times, so you can always keep track. With the online profile feature, you can monitor all of your transactions and review your payment and call history in detail. View your call history in the app or online, and have access to all of your records. This is a great way of controlling your long distance budget with accurate up to the minute detail of your usage. Our networking team ensures 24/7 monitoring of all systems and calling lines to ensure the best connections for you. We are dedicated to make sure you receive the highest call quality out there. Our state of the art telecommunicating infastructure enables us to create the best calling quality for all of our users. Our free calling app offers premium features that you normally have to pay for, like call display, call conferencing and voicemail. 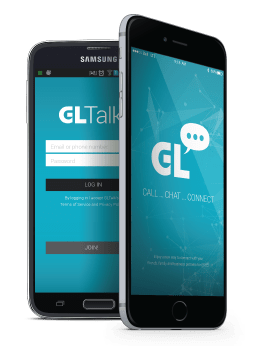 Download and start using the GLTalk internet calling app today!